Want to get started curling now? While we continue the work of building the Monadnock Curling Club, you can get started right now at the Petersham Curling Club (PCC) about 45 minutes south of Keene, NH, in Petersham, MA. The season has begun there and curling leagues are running all nights of the week and on the weekends. There are leagues for men, women, mixed teams, competitive teams, beginners and youth. You can contact the Petersham CC to find out how to get more involved. If you have never tried curling before, they do offer “Learn To Curl” clinics from time to time. Several of us involved with this Monadnock Curling Club effort curl down at Petersham CC because it is the closest curling club to Keene. It’s a great place and an awesome group of people! As far as getting there, it’s a straightforward (although winding and twisting) drive down Route 32 (the road by the Keene airport) that goes down through Richmond, NH, then over into Royalston, MA, and then Athol and finally Petersham. The PCC is right on Route 32 so as long as you stay on the road you’ll get there. Please do check it out and consider getting started with curling today! 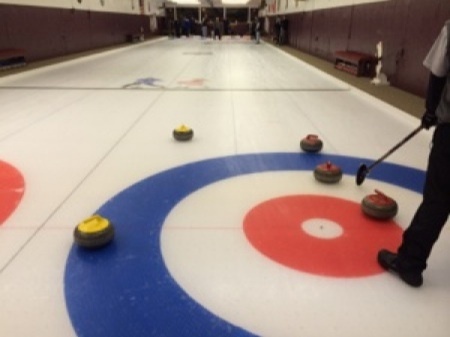 This entry was posted in Curling and tagged Petersham CC on October 31, 2014 by Dan York.